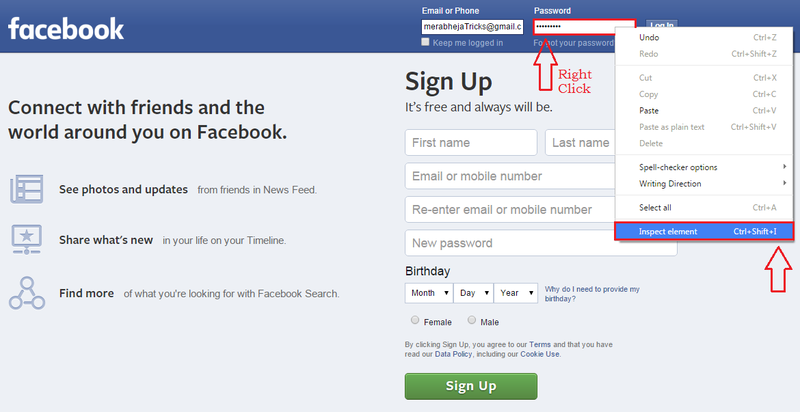 How To View A Hidden Facebook Password On Your Browser:- So your friend wants to use your computer to login into his Gmail or Facebook. Yeah, sure no issues. But how about a little hack here? What if you get to see his password as he types it? You might argue with me that passwords cannot be seen as they are always entered in a hidden format. Mostly when people enter their email ids, they enter it by looking at their keyboards and check it only once they have completely entered it. Next turn is of password’s; like the way people enter their email ids, they look only at the keyboard while typing their password and look up only once they are completely done. So if you can find a way at all to change the hidden format in which passwords are entered to visible format, you can easily view the passwords as they are typing . Read on, to learn how to hack this simple trick. 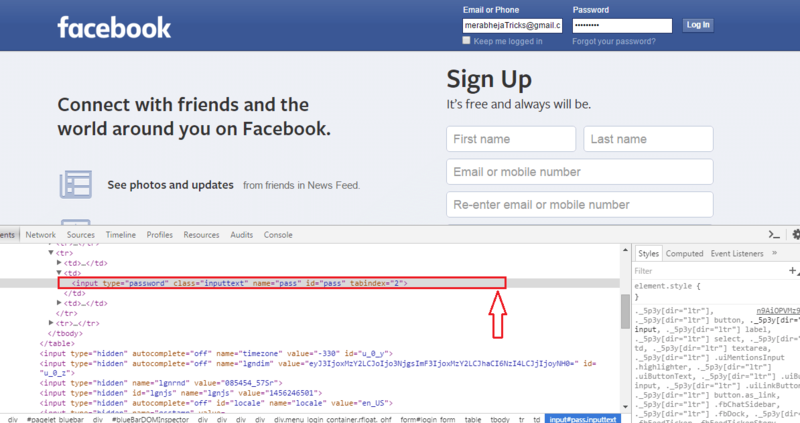 Open Facebook on your web browser. As usual, enter your login credentials. After entering the password, right click on the password field and from the menu that gets expanded out, click on the option named Inspect element. A new window will open at the bottom of your browser. These are the developer tools. An entry will be highlighted as shown in the following screenshot. It says that the input type is password. Simply click on the word password. This will let you edit the value of type attribute. Change the type value from password to text. If you have any doubts on how to do it, kindly take the following screenshot as a reference. After you have changed the input type value to text, look at the password field at the top of your web page. You can now see that your password is no longer hidden and can be read perfectly by anyone. Not over yet. As long as you do not refresh your web page, this effect lasts. You can type in anything to your password field to check whether the typed letters are in password format or in text format. 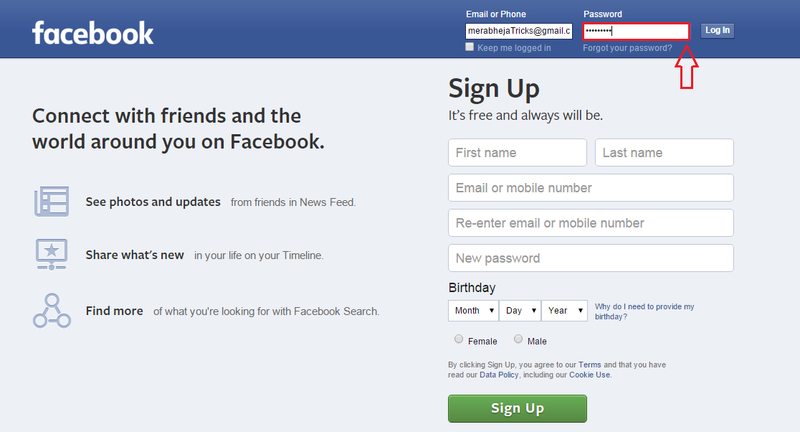 This trick is not limited to Facebook alone. You can try the same with any web page. What are you waiting for? Get your friend to enter his password and hack it before he knows. Try out this trick today itself. Hope you found the article useful. Special Note: If your friend hits you after you play this prank on him/her, merabheja is not responsible. Yes, just joking.